No Maintenance! Have a Happy New Year! 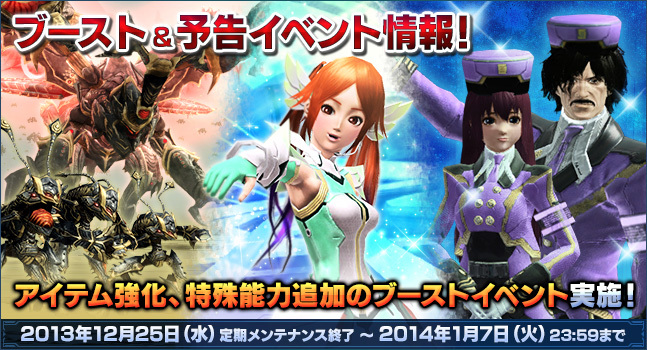 PSO2’s final update for 2013 released on December 25th, 2013! We received a new team room, story quest, and a New Years AC scratch. On New Years day, we’re getting the New Years Lobby and Revival Scratch. If you typed in the secret phrase prior to 12.25.2013’s maintenance, you will receive a 2014 FUN ticket on New Years Day. 250% Rare Drop Booster if you signed in between 12/11 ~ 12/13 emergency maintenance. 250% Rare Drop Booster if you played Merry Christmas on Ice 2 before 12/13’s emergency maintenance. +100% Tribooster for 12/13’s emergency maintenance. It may be possible for server connection issues to arise whilst a character is transferring to another ship. As Sega works to correct the server connection issues, they have decided to temporarily suspend the Ship Transferring service after tonight’s (Dec. 25th) maintenance. They will announce the reopening of this service some time in the future. If you wish to transfer to another ship, you should do so before maintenance begins. Sega is also considering distributing some form of compensation in response to this issue, the details will be announced some time in the future. A +5% success to both item grinding and affixing will apply between December 28th @ 0:00 JST ~ January 5th @ 23:59 JST! All Quests Receive ＋50％ Rare Drops and Rare Enemies! Everyone who logs into the game sometime after maintenance on December 25th through January 8th will receive several prizes. In addition, if you log into the game for a certain amount of days between December 26th 0:00 JST through January 7th 23:59 JST, you’ll win even more prizes. The Tribooster will be sent to the Visiphone immediately if you log in during Campaign Period 1. The FUN Ticket, EXCube, and Rare Drop Booster will be distributed Early February. Spend certain amounts of AC during the campaign period to receive several items. By resetting a skill tree using AC at the Class Counter. By using AC to create another character. 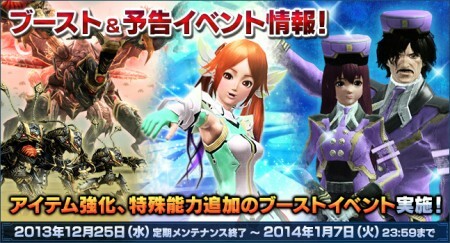 PSO2 Crafting System Lets You Customize Weapons, Units, and Technics.